A TALE OF TWO PROVINCES? [Ottawa – October 7, 2015] After holding a statistically significant lead for 20 consecutive days, the Conservative Party’s lead has shrunk to just under two points and the party is now statistically tied with the Liberal Party who, not even two months ago, were in danger of being squeezed out of what had looked like a Conservative-NDP race. The NDP, meanwhile, is not making up any ground and may in fact be falling back slightly in what is increasingly a two-way race. [Ottawa – October 6, 2015] The Conservatives hold a stable but narrowing lead over the Liberal Party which has been moving up in the past week. The NDP, meanwhile, has declined and the party is plateaued right now. [Ottawa – October 2, 2015] With just 17 days until Election Day, the Conservative Party holds a clear (albeit somewhat narrowed) lead. Our poll of last week was controversial at the time as no one else was showing a clear Conservative lead. Our internal daily tracking (now being shared after the fact) shows that the Conservative Party has held the lead for 15 consecutive days and they now find themselves in roughly the same range as where they were at this stage of the 2011 election campaign. This survey was sponsored by La Presse. The full article is available here. WHAT ARE THE FORCES SORTING THE ELECTORATE AND WHAT ARE THE PROSPECTS FOR PARTIES IN THE HOME STRETCH? TRUDEAU’S LIBERALS GETTING THEIR GROOVE BACK? [Ottawa – August 28, 2015] Voters are awaking from their summer slumber and noticing that they have been asked to follow what is going to be a very divisive and acrimonious campaign. At 34 points, the NDP maintains a clear and stable lead. The Conservatives, meanwhile, have dropped to 28 points. The Liberals, at 27 points, are doing much better than a month ago and are statistically tied for second place (and are not far off from the lead). The Green Party remains at six points. 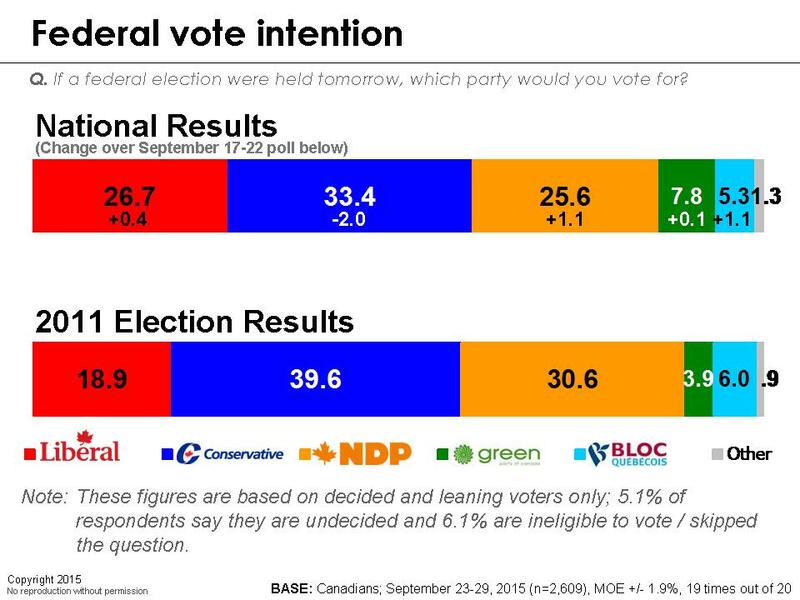 [Ottawa – August 14, 2015] Nothing definitive has emerged from this week’s polling. The race remains very tight with the NDP having plateaued, but they are still hanging on to a slight lead over a pretty moribund Conservative Party. The Liberals are showed some signs of life and may be closing the gap somewhat. [Ottawa – July 31, 2015] Nothing much is clear as we complete our midsummer check-up on the state of the largely distracted voters. There are, however, some interesting developments that set the stage for what will be a much more fiercely enjoined debate which will commence with the upcoming debate on August 6th. These become even more important on the eve of what could be an early and unusually protracted campaign. [Ottawa – July 17, 2015] There is not much going on out there in summer vacation land, but we do see some modest shifts in our most recent polling. While everyone is focussed on cottages, pools and BBQs, let’s try and set the stage for the inevitable return to what is going to be an exceedingly important and interesting campaign. We will begin by noting what we see as some of the relatively stable and important features of the voter landscape. [Ottawa – June 19, 2015] The NDP continues to hold on to an insignificant lead, but they have been brought back to Earth by the return of Gilles Duceppe in Quebec and a mild resuscitation of the flagging Liberal and Conservative fortunes. There is some encouraging news for the Liberals who have seen a mild rebound, which is possibly linked to the major announcements of early week. This rebound has left the Liberal Party only five points out of the lead, half the distance they encountered last week. [Ottawa – June 12, 2015] For five of our last six polls, the NDP has improved its standing with Canadian voters and the party now stands at 33.6 per cent, a 16-point improvement over its modern low just four months ago. The NDP have nearly double the support that they did this time out from the 2011 election. Support for the Conservatives and the Liberals, meanwhile, continues to languish with the two parties standing at 27 points and 23 points, respectively. [Ottawa – May 14, 2015] In a striking new development, the federal horserace has morphed into a virtual three-way tie with just three points separating, the Conservatives, the NDP, and the Liberals. Interestingly, we saw similar results about two years ago, when all three parties were within five points of each other.